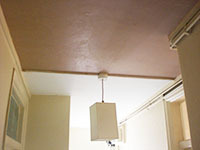 The Earlsfield Plasterer plasterboarded the walls & ceiling in this loft kitchen. 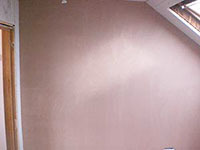 The plasterboard was then skimmed with finishing plaster leaving a smooth plaster finish ready for painting. The numerous angles caused by the sloping ceiling made for an impressive finished room. The Earlsfield Plasterer was asked to skim plaster the recently stripped walls in this lounge. Having cleared the room totally & taken off any radiators the client ensured that our plasterer could complete the job within the day. So by the time he returned from work he was able to admire his smooth polished lounge walls. 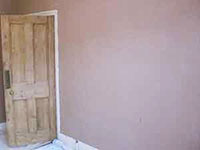 The Earlsfield Plasterer succesfully quoted for this insurance work in Earlsfield. Water had leaked through from the floor above causing damage to the hallway ceiling.